Looking for a refreshing and easy to make mocktail recipe? If so, I think you're going to LOVE this one! It's perfect to whip up for all of your party guests who don't want to be served any alcohol or whip up some great-tasting mocktails for all of the designated drivers who are attending your party. 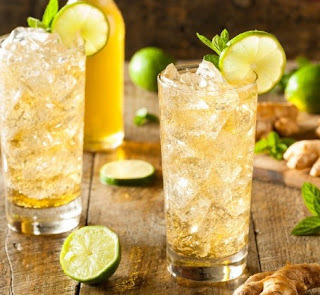 Today's guest post recipe is courtesy of Bruce Cost Ginger Ale. You can check out their website for free cocktail and mocktail recipes and to learn more about the company. The following recipe makes approximately 2 servings. Directions: In a collins glass with ice, combine the listed ingredients. 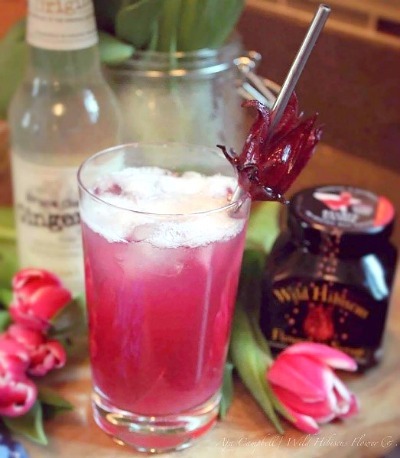 Stir, add a funky straw and a Wild Hibiscus flower to garnish! Serve immediately. Here's a bonus recipe and the next one is indeed a cocktail recipe! Directions: In a tall glass with ice, combine the listed ingredients. Stir, garnish with a lime wedge and enjoy! Serve immediately. I love the Wild Hibiscus Sharleen Mocktail more than the scotch and ginger cocktail. I love how the hibiscus syrup makes the mocktail a pretty rose color.